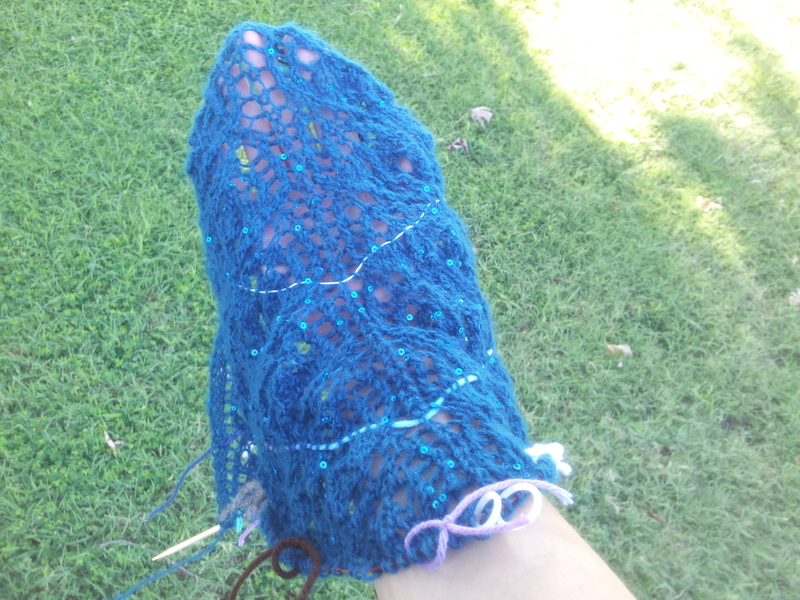 Workbasket Wednesday – Valois Shawl – And the end of July is here! – That's StitchTastic! My typing fingers have been silent a lot lately. But not because they want to be! July has been an extremely busy month for all of us. I ended a temporary job, started a new part time job, secured an arrangement to teach knitting classes (more of that soon), and the girls and I getting entries ready for the Tulsa County Fair (more on that later too). Whomever coined the term “lazy days of summer” didn’t live in my house, that is for sure. I have a busy life. And I love it. I would not trade anything for the world (except I would like to be out of debt right now, and I would like to have my husband finished with his graduate degree right now). We turned in entries for the Tulsa County Fair yesterday. My goal was to finish my Valois Shawl and enter it into the fair. But, alas… my part time job cut into my knititng time. Oh well… if it means we can be out of debt sooner, it is worth it! 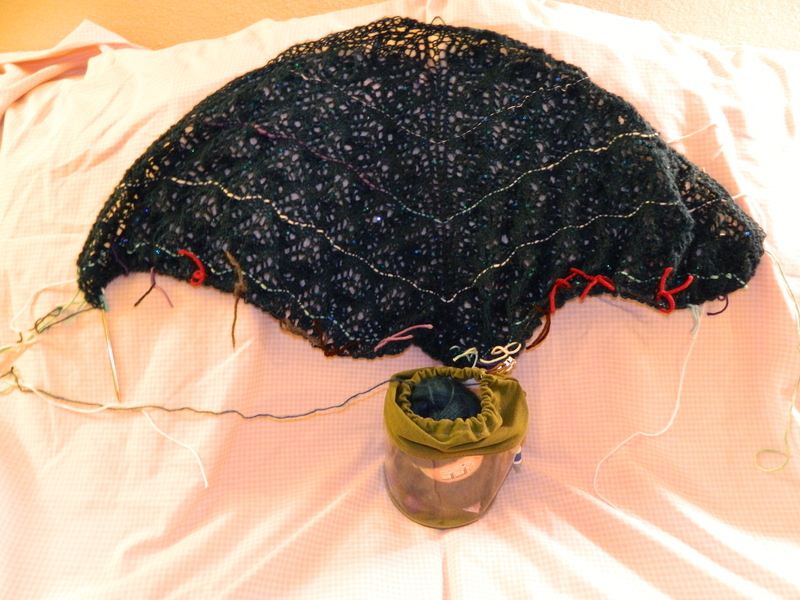 So I am currently still plugging away on my Valois Shawl. I am sooooo close to finishing, currently half way through the last pattern repeat. 28 more rows before I can start on the edging. This is what the shawl looked like nine days ago, approximately half way through the 2nd pattern repeat. And this is what my shawl looks like this evening when I stopped for the night. I am half way through with the 5th pattern repeat. The needle is not long enough to really let the shawl stretch to its potential wingspan, but I hope you can see how this shawl really grows from the center out and down. This shawl looks complicated because of the chart, but honestly is really enjoyable to knit up, and has almost become mindless knitting as long as I keep track of the row number. It has been my companion through many episodes of Start Trek Next Generation, and all episoses of “Call the Midwife”. I will probably knit up another Valois Shawl in the near future for my grandmother in love. I apologize for the bad pictures. But I am not a professional photgrapher. However I am learning and am getting better! I have several other projects that I pulled out of hibernation to work on a little at a time. Like my Log Cabin Socks, and my Lacy Leafy Baby Afghan. I still kept my Haruni in hibernation, because I want to add beading to the edging and I want to be able to devote some time to that project. I am making all other projects a priority to finish so I can give Haruni the love it deserves. 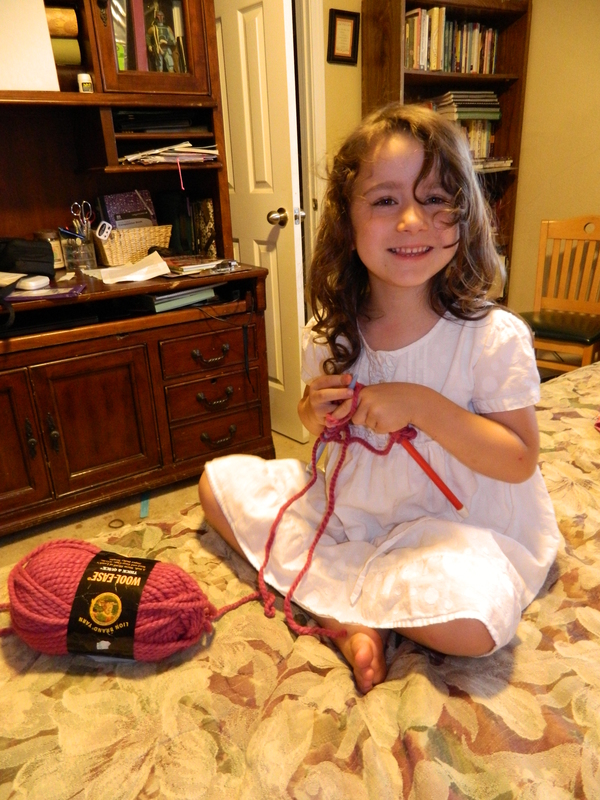 My 5yo daughter, Little Miss Daredevil, wanted me to show her to knit today. So I pulled out Knick and Knack, my kiddie knitting needles and a ball of chunky yarn to let her try. I cast on for her and knit a few rows for her, then showed her how. It did take her a while, and I fixed quite a few mistakes, but she is actually doing very well! It has been very cute to hear her saying this over and over. She wraps the yarn in the English Style, except that she holds the yarn with her left hand, like the Continental Style. It will be interesting to see which style she gravitates towards as she practices more. I think she is trying to be just like mommy, and this makes me smile. That shawl is looking beautiful. I haven’t got the patience for beaded knitting, so I’m doubly impressed. I love that your girls are into fiber crafts! I hope my daughter shows the same enthusiasm when she’s older. I’d love having a knitting buddy right at home. A) Your shawl is beautiful! One day soon, I hope to start on a similarly intricate shawl. I expect it will take me ages, but it will be worth it, right? B) Your daughter is adorable! I think I first learn to knit at around her age. Hopefully she keeps at it! You should start one. Yes it might take you a while, but it will be so worth it. Anything beautiful that is one of a kind and hand made is worth it. Thanks again! Have a blessed day!